Event – 60th birthday party. What I love – The birds! Challenge – Near disaster when cake almost collapses in the car!! This is really where CAKES MEET ART! 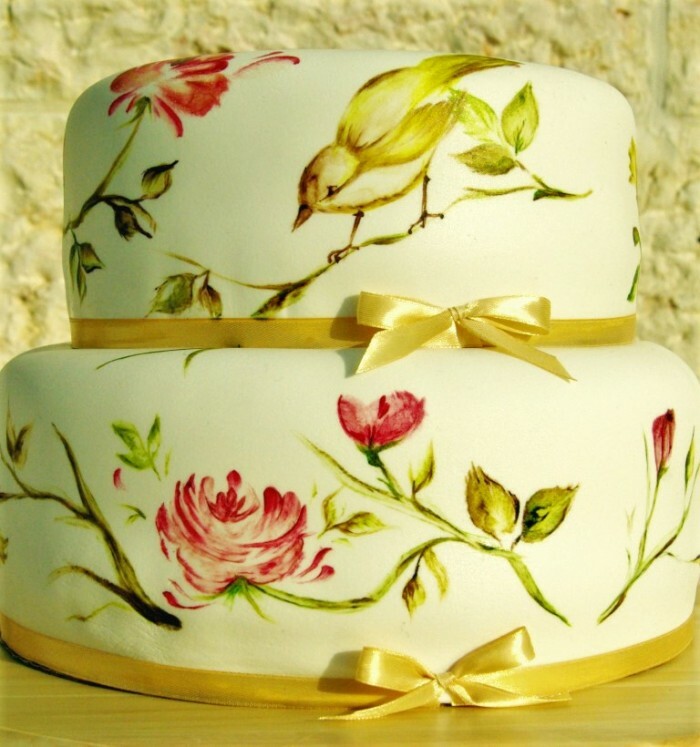 I get inspired from the art world when designing my cakes. I always keep in mind composition, proportion, balance and the right color combinations to get an artistic finish. This cake was ordered for a 60th birthday party. The client liked nature so I decided to go with birds and vines. I gotta say, it was a healthy breath of fresh air to take a little break from the 3D gum paste/ fondant sculpting and engross myself in a two hour long painting session. I had to figure out how to apply the edible food coloring in a way that would imitate the water colors I use when creating a real painting. I was pretty impressed by what these edible gels were able to accomplish. During the process, I ignored the fact that this was a cake and treated it like a piece of canvas. I started off with the three primary colors – red, blue and yellow and mixed a whole bunch of different shades along the way. I almost had a disaster delivering this one! The event was taking place about an hour drive away from my house. Anyways, I’m on the way to the event when a car in front of us stopped short. The driver stepped hard on the brakes to avoid a collision and I heard a little thud…. I carefully opened the cake box and assessed the damage. The top tier completely shifted and almost fell off the bottom of the cake! B’H there was no damage to the actual painting and other decor. I slowly but carefully pushed it back on. It didn’t look perfect but it could have been way worse! I realized afterwards that I forgot to remove the baking paper from under the top tier!! That made it really slippery which is why it slid off. Don’t think I will be making that mistake again!